Providing the K-12 community with resources, networking and support for innovative service learning. At our fall meeting, ECSL advisor Sammy Lyon outlined how planning for service learning fits seamlessly with the classroom planning you’re already doing. The article For Teachers Who Think They Can’t Do Service Learning accompanies the easy-to-implelement lesson planning tools that were presented and gives you a road map for integrating student-led action into the curriculum you already use. Download a free copy of the tools- Backwards Planning for Service Learning- to support your service learning curriculum. Sierra Leone Rising (formerly the Kposowa Foundation) is celebrating its 10 year anniversary with an evening of African drumming & dance, salsa dance performances, and fundraising for projects in Sierra Leone. Thanks to ECSL advisor, Sarah Culberson (co-founder of Sierra Leone Rising) for sharing this local opportunity to effect change in the areas of education, public health and female empowerment in West Africa. 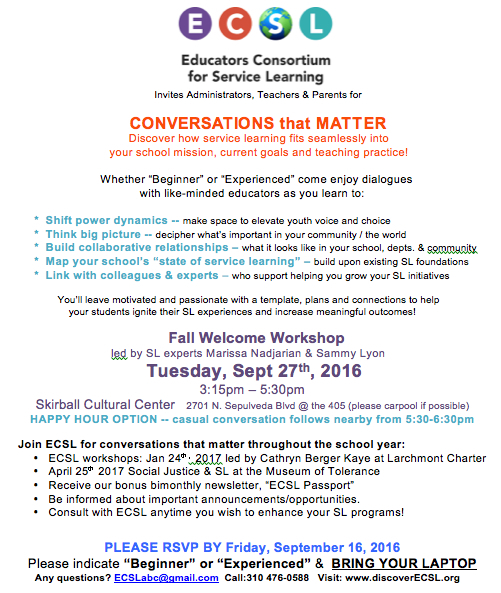 ECSL Fall Workshop: Conversations that Matter! On Saturday, April 16th ECSL joined with the Green Ambassadors Institute, a professional development program through Environmental Charter High School, to engage in a first-of-its-kind experiment: The Curriculum Hack. It was based on the shared experience of many teachers that there is no one-size-fits-all curriculum. An educator is a kind of jigsaw puzzle expert. They are constantly fitting together the puzzle pieces (standards, time, current events, learning styles, youth interests) to create the big picture (a curriculum that best serves their students). With so many factors to consider when deciding how to deliver content, teachers rarely use a published curriculum verbatim. They take out, add on, or adjust lesson plans to create something that fits the needs of the class. Teachers may do this in isolation or amongst their planning teams on campus. 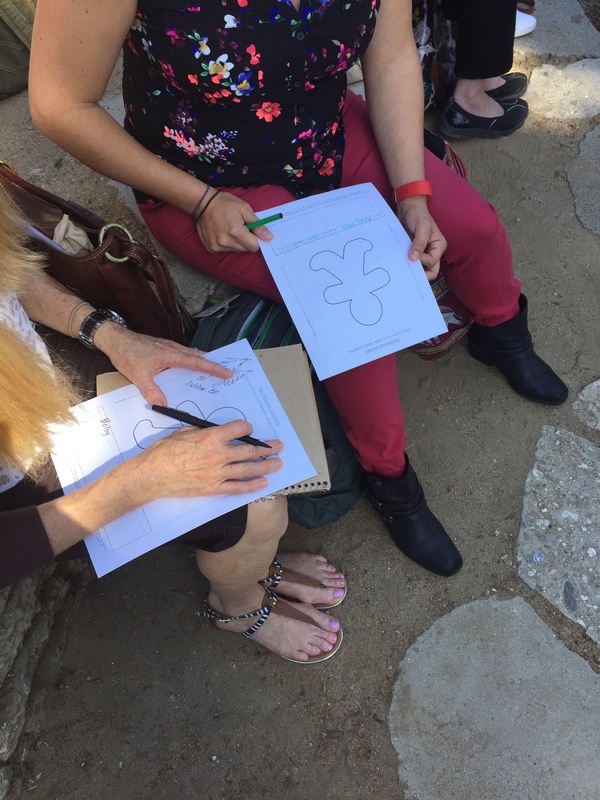 But at this spring’s BioDiversity Summit, Green Ambassadors gave educators access to a valuable resource in this process of tailoring curriculum- diverse perspectives. At the start of the summit, ECSL led participants in a personal inventory activity that revealed each other’s interests, skills and talents through a guided interview process. 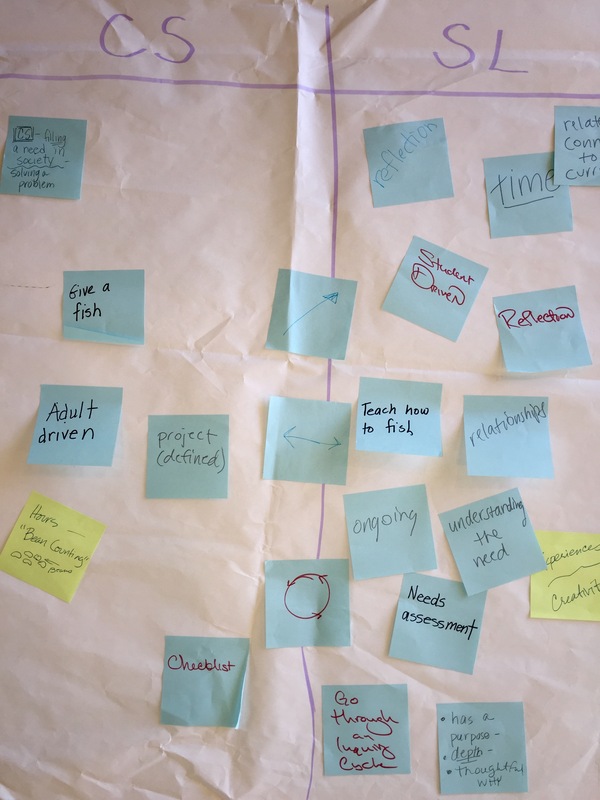 Later, when it was time to hack the curriculum together, each member could reflect on their traits, background and experiences that would impact their group’s lesson planning process. This year’s institute theme was BioDiversity, and the experience lived up to its name. The diverse skill sets present amongst each group member led to rich explorations of environmental justice themes for all grade levels. Green Ambassadors has made available the lesson plans created in this collaborative curriculum development experience (where you can also access the Personal Inventory activity presented by ECSL). We look forward to connecting with members and new participants alike at the ECSL Fall Meeting scheduled for September 27th at The Skirball Cultural Center from 3:15-5:30pm. 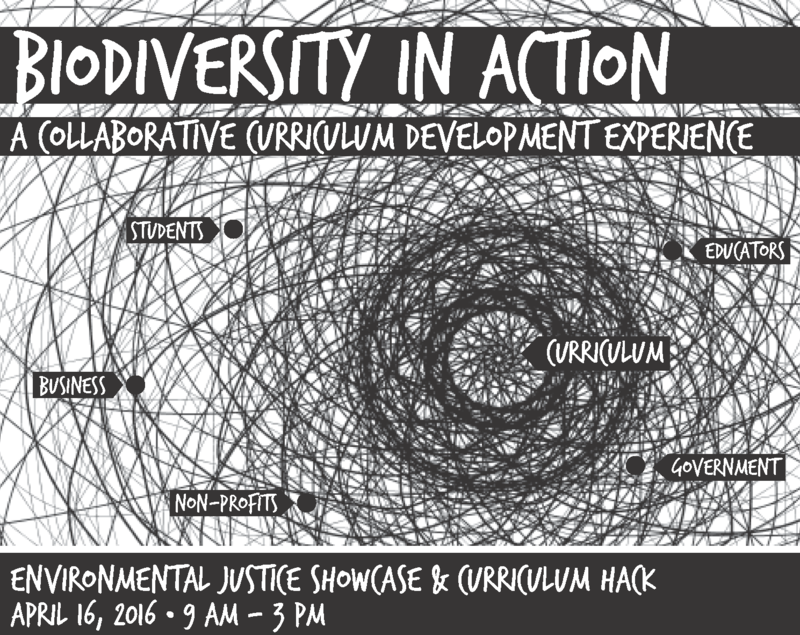 Join us for another unique opportunity to network with a variety of stakeholders in the service learning community. This winter’s ECSL workshop featured international service learning expert, Cathryn Berger Kaye, who helped us rethink the ways we engage students in reflection. Here, participants explore reflection strategies throughout the stages of service learning: investigation, preparation, action and demonstration. 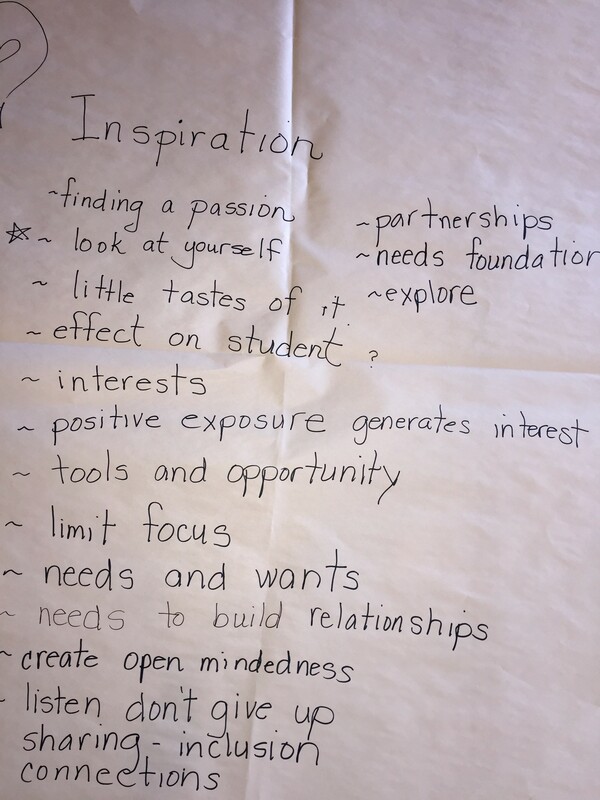 We share some of the work and responses here to help continue the dialogue about the importance of taking time for reflection and how we can consider a variety of ways to reflect- both large and small, quick or lengthy, and through a range of different learning modalities that reach all students. Take a moment to reflect on what strategies you see here that can be implemented within your classroom. 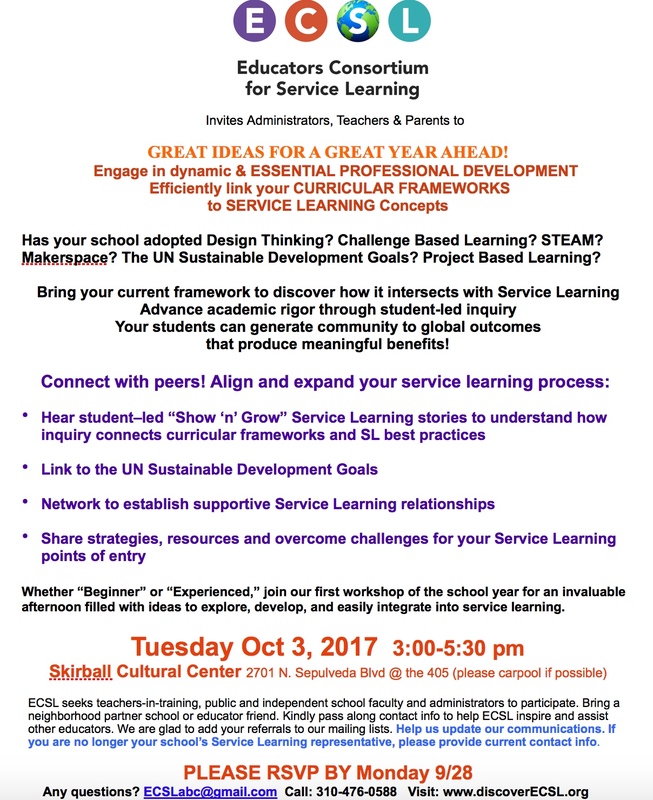 Special Opportunity to Share your Service Learning Work! ECSL is making available a special opportunity. You are invited to share a 10 minute talk with 5 min Q/A in a roundtable type conversational format. We are providing a personal ECSL mentor to help facilitate review and teacher preparation for this collaborative workshop along with a simple template to utilize. The purpose is to discuss the process, more importantly than the result. It will be an chance for you to examine various stages from where you might have felt stymied in your SL process, to taking positive outcomes to the next level. This meeting will provide time for interaction, exchange of ideas/needs, connections and will genuinely aid faculty with the five stages of service learning, fostering student voice and choice and developing meaningful community benefits. WE HOPE YOU WILL CONSIDER JOINING THE OTHER FACULTY (from K-12 schools, private & public) who have agreed to tell their service learning stories….Faculty who shared at last year’s ECSL expo felt they actually learned more from the experience than the observers….so take advantage of this unique opportunity to partner with an ECSL mentor and enhance your service learning (no matter whatever stage you are currently practicing). PLEASE REPLY to ECSLabc@gmail.com as soon as possible IF YOU WOULD LIKE TO RECEIVE an ECSL mentor and the presentation template. INCLUDE: YOUR NAME, CLASS LEVEL/SUBJECT TAUGHT, TOPIC PRESENTING. This “show and grow” will take place in the morning, although there are worthwhile activities and exchanges from 9-3pm. The topic you choose does not necessarily need to be environmentally based…. any Service Learning program in which your students are currently engaged has justice and curricular tie-ins. Lastly, feel free to bring some of your students along to present with you and experience the day. 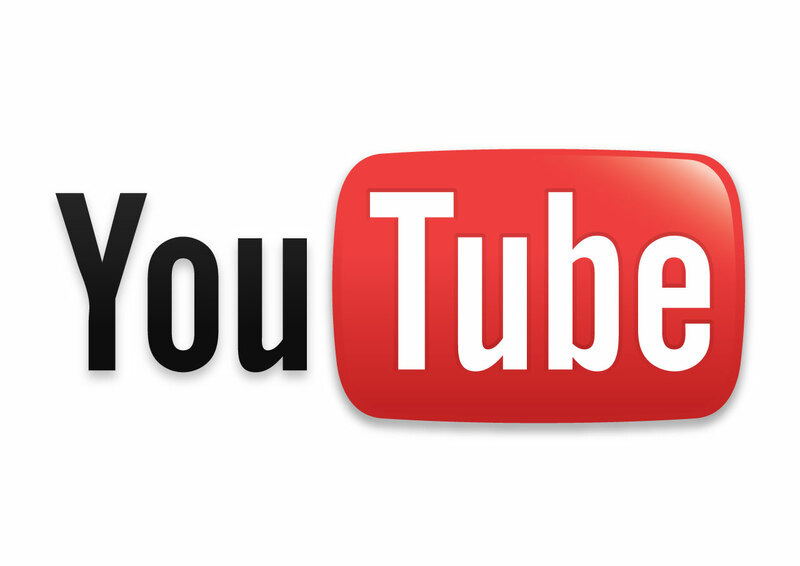 .….We are looking forward to hearing back from you soon and hope you choose to be a part of this exciting day! Repetition and reflection– two keys to solidifying new information. We strive to do this with our students so that their learning sticks, but do we do this with our own professional learning? At our winter meeting, Cathryn Berger Kaye offered us insights that helped refresh our reflection stages of #servicelearning. We gained new tools to help add meaning and perspective to the service learning process- for both our students and ourselves. Now, we would also like to offer you an opportunity for repetition to solidify these new skills even more! Below are links to the footage of this dynamic meeting, so that you can revisit and refresh your reflection techniques anytime. Or, watch with your colleagues and allow this footage to be your muse. Discuss and develop reflection techniques that make sense for your curriculum! Service learning offers students authentic opportunities to construct their own knowledge versus being told the “right” answer. With service learning, there often isn’t one right answer, outcomes are open-ended and definitions are subjective and changeable. In fact, with service learning, students are able to continuously construct and deconstruct what they know through practices like research and reflection embedded in this learning process. At ECSL’s fall meeting participants were offered many opportunities to experience this for themselves. First, participants worked together to build definitions of community service versus service learning. Below is an example of how people represented the similarities and differences between these two concepts. Let members of your own school community construct their understanding of community service and service learning by seeing this activity in action here. Added bonus: the method can be adapted to define and distinguish many other concepts in your classroom, too! Afterwards, and the highlight of the meeting, was the opportunity to hear stories of how three student groups engaged in service learning at their respective schools. With each presentation, their ownership of the process shined through. These students experienced the power of constructing knowledge through service learning. Featured at the meeting were an elementary water awareness project, a middle school STEAM partnership with a local charter school, and a high school sustainability audit with a local business. You can find footage of these stories from the meeting here. Witness the 5 Stages of Service Learning in action and consider how these experiences can be adapted to meet the needs of your grade level and curriculum. Later, participants engaged in round table conversations to address each others’ questions surrounding their service learning practices. Participants self-selected into topics that were on their minds. Just like service learning itself, there was no expectation for one right answer to the issues brought forth. Instead, the conversations served to pool member’s collective knowledge and experiences and help them develop tools to address these areas of service learning. The photos below reveal how some groups represented their conversations. 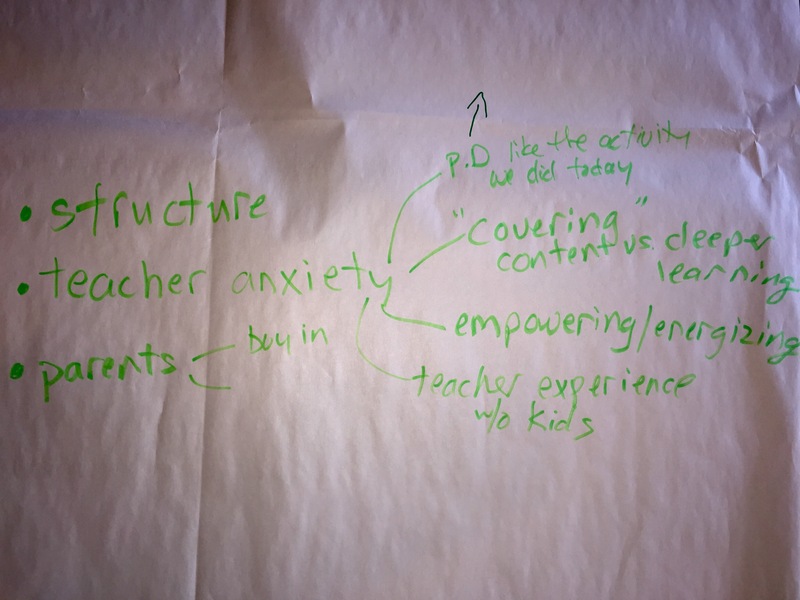 See how ECSL structured these open-ended round table discussions about the issues that mattered most to the participants here. ECSL exists to bring service learning to life- through real-time stories, networking and support for your program challenges. At this meeting, your experiences were at the heart of the conversation. We look forward to continuing the dialogue at our winter workshop on February 2nd, 2016! Your contributions will make a meaningful difference in providing young people the tools and desire to improve our communities, local and global. Write to ECSLabc@gmail.com for any questions. Service-learning is a powerful, hands-on teaching and learning strategy that integrates meaningful service and classroom content. The process creates authentic learning opportunities while teaching civic responsibility through service to others with reciprocal benefits for all involved. ECSL provides K-12 teachers and administrators opportunities to advance service-learning through professional development and collegial exchange. ECSL also connects parents and community partners with schools and students to facilitate dynamic service-learning experiences.